In 1943, while working for the OSS in London, Julia McWilliams was introduced, by her boss “Wild Bill” Donovan, to James Corbett, a spitfire pilot in the RCAF. It would become a longtime friendship lasting until her death in 2004. When they went out to dinner, Corbett frequently regaled her with tales of his home near Calgary, and the big elk, moose and deer that were in the woods near his home. 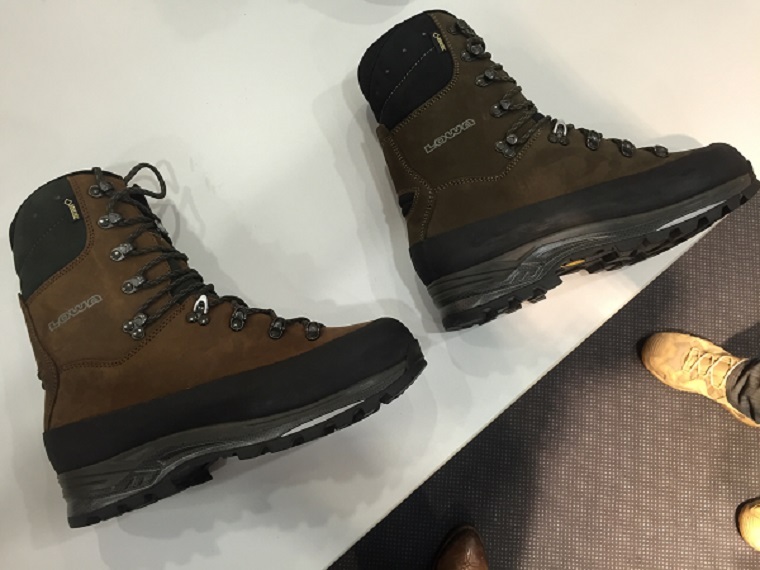 Most of all, he recommended she come out and enjoy the wilds of Canada. Eighteen years had passed and McWilliams finally accepted Corbett’s invitation. By this time they had both married, and McWilliams was now arriving at Calgary Airport with her husband Paul Child. 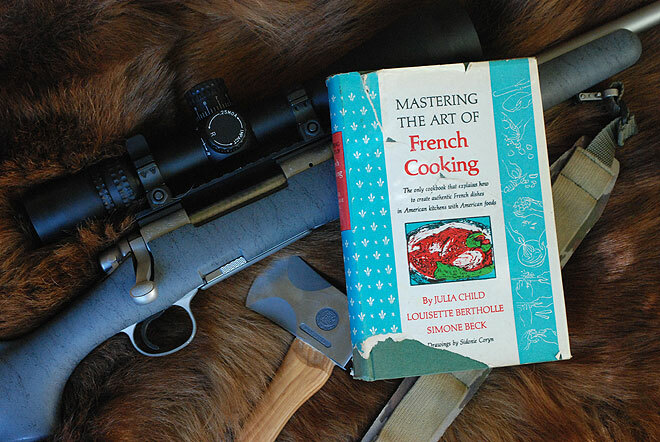 For dinner that night, Corbett’s wife Michelle, a French-Canadian native of Quebec prepared a spin on her family’s favorite dish, using the black bear James Corbett had taken only a few days before. It reminded Julia Child of Boeuf Bourguignon she had just perfected while finishing the compilation of her soon to be released Mastering the Art of French Cooking. …Ah, if only it happened like this! Quite an adventurous lady—Julia was actually hoping to jump into WWII France with OSS agents, but instead was made a top researcher directly under “The Father of Central Intelligence” General Donovan—I’m sure Child would have much enjoyed this spin on what would become her boeuf bourguignon. There was a Colonel James “Jim” Corbett, but he was more famous for wildlife conservation and hunting man-eating tigers for the Raj and the British Colonial Government in India (his first tiger had 436 confirmed kills through his belly before Corbett got him): he also was neither a pilot, nor a Canadian, and though quite a writer in his own right (check out Man-Eaters of Kumaon) I don’t think he ever met Julia, and died just six years before the release of the book that would open a whole new career to her. These were the just mental machinations of a writer working on his first novel, delirious under the flu (though not as badly as when I’ve had malaria and the relapses…but that’s another story), and a heartily enjoyed bowl of Ours Bourguignon. I think it blows away any bourguignon made with common beef. This dish was instigated by my running across our family’s 1970 copy of Julia Child’s Mastering the Art of French Cooking, that Child co-authored with Louisette Bertholle and Simone Beck, and my French-Basque hunting buddy Arnaud Bidondo giving me a pound of stew meat from a nice brown-phase, 6-foot black bear he got last year. When I went through Child’s boeuf bourguignon recipe, though, I noticed she really only mentions thyme and a bay leaf as spice other than black pepper. Also, there’s only salt bacon. I wondered what would happen if you used Herbs de Provence. Standardized in the 1970s as a dried herb mixture from Provence (savory, thyme, basil, fennel) it also incorporated for American tastes, lavender. 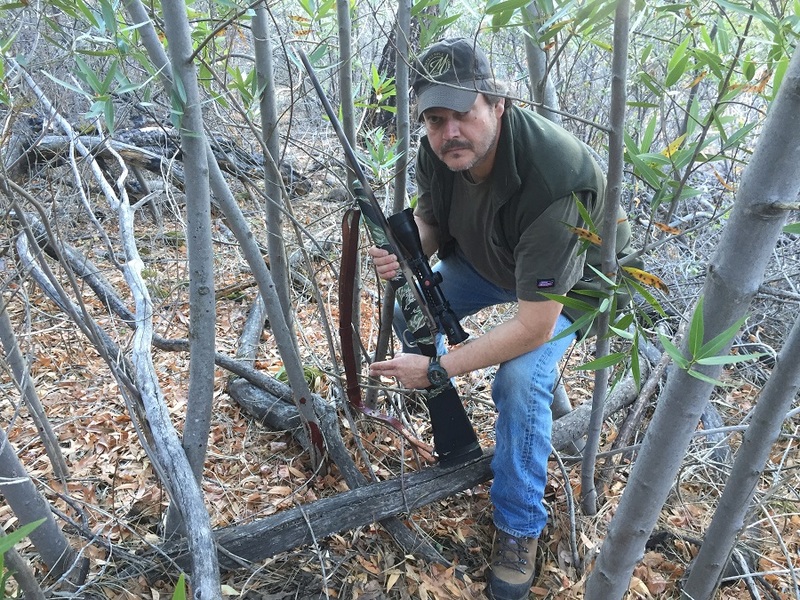 As my colleague, Hank Shaw says, brandy goes well with lavender, and after having tried it with so many other recipes, I can honestly say that just about everything goes well with lavender, especially sweet meats, of which bear can be, and especially so in California, where many bear taken by hunters without hounds are during the early part of the season, when the black bears have been fattening up on blackberries and mazanita berries. 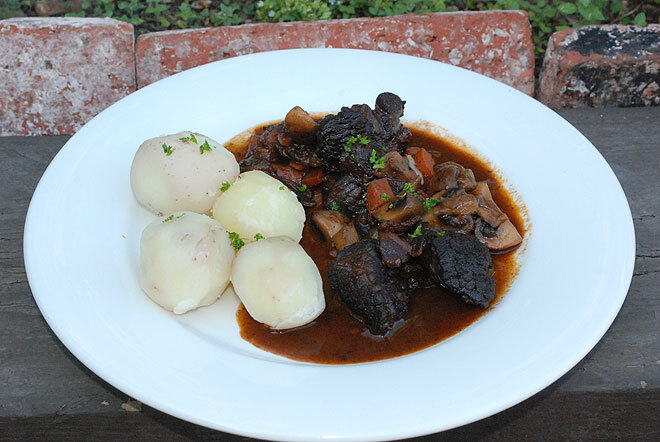 I wanted something that didn’t take as long to make as the original recipe, and would be simply amazing…So here’s my rendition of Julia Child’s Boeuf Á La Bourguignon, with ours replacing boeuf—Bon Apetit! 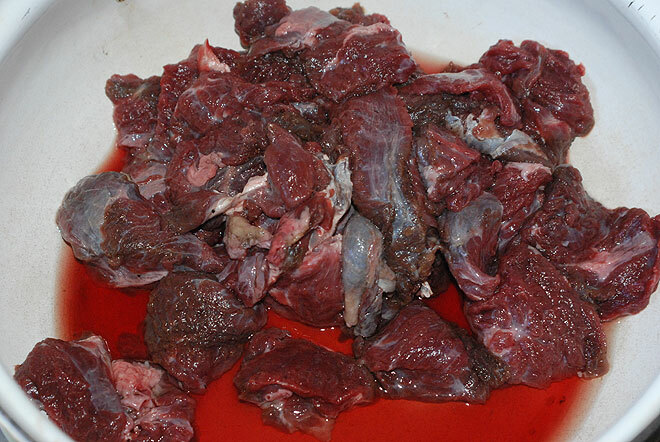 NOTE: Unlike venison, remember to cook all bear meat through, like pork, because of the possibility of trichinosis. Nothing wilder than, and as robust as black bear meat! Take a cassoulet or clay pot ( I prefer to use a large Vietnamese/Chinese clay pot that go for only $9 in San Francisco’s Chinatown—just before using make sure you soak it in cold water for at least 45 minutes, else it’ll crack, especially if using it for the first time). 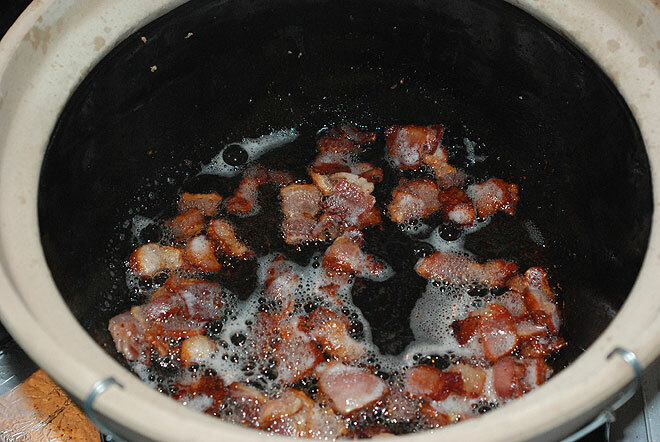 Cut the bacon strips into tiny squares, and fry them in the olive oil clay pot. Render out all the bacon fat, setting aside the brown bacon bits. Brown the bear stew meat, frying only a few pieces at a time to make sure they brown instead of cook, setting browned bear meat with the brown bacon bits. With all the bear meat browned, sprinkle the flour, salt and black pepper on top and toss the meat and bacon to make sure they’re all lightly coated. Toss the chopped onions and carrots into the claypot and sweat them until the onions are almost translucent. Pour in the 3 cups of red wine and scrape off as much of the brown goodness that has stuck the bottom of the clay pot. Add the can of beef consommé and dissolve the tbsp of tomato paste in the pot; then add the browned bear meat, bacon bits, and the spices and give a good stir. Here’s where you a lot of leeway with a claypot. You can either put it in the oven at 325-degrees Fahrenheit. 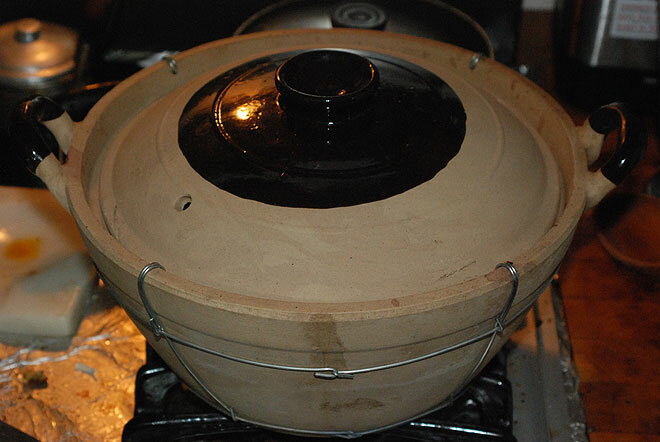 NOTE: DO NOT preheat an oven for a clay pot—you’ll crack the pot! Just insert the clay pot and turn the heat on the desired degree. Or, do as I did. Put it on the stove on high heat and get the bourguignon boiling, then back off to medium heat and cover to simmer for the next 3-4 hours: until the bear meat is fork-tender. In the last 45 minutes, pour in the small white onions. During the last 15 minutes add the butter-fried mushrooms, giving a slow stir. Bear Bourguignon is really that good! Display the clay pot at the center of the table, on a wood or cloth pot holder (never a cold stone, else the immediate temperature shift will crack the clay pot). Remove the bay leaf and throw it away. Serve over mash potatoes, wide, flat egg noodles, or with a side of small peeled potatoes. If you do serve with noodles, use only butter on the noodles. I tried coating the egg noodles with olive oil and it really overpowered the delicious flavor of the ours bourguignon. Sprinkle chopped parsley lightly on the side and ours bourguignon. 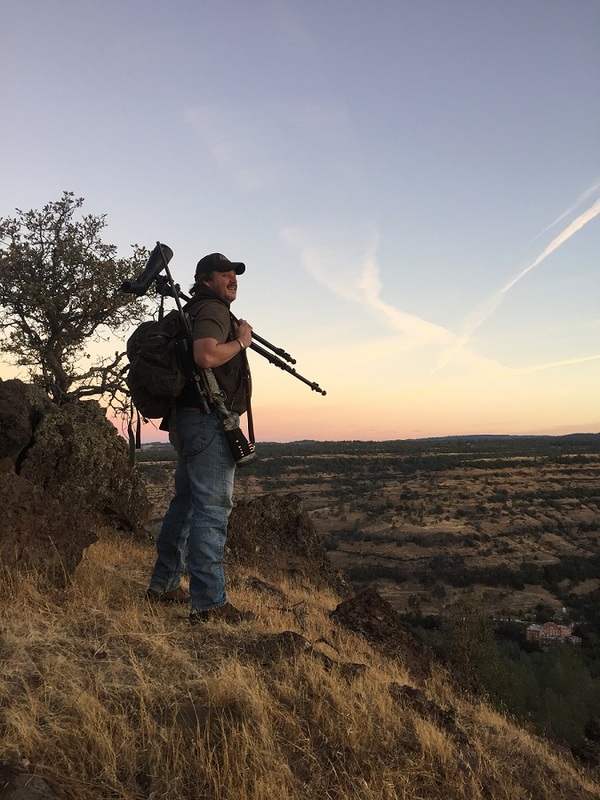 With how many more black bears there are in California than legal bucks (largely due to an overpopulation of major predators like bears and mountain lions, but more because of the counterproductive moratorium on hunting the heavily overpopulated California puma), it behooves every hunter to get a black bear tag to hunt in open areas. This is especially so with how much opportunity there is these days, with new open areas in the Southern/Santa Barbara County section of Los Padres National Forest. Guess the millionaire residents in Santa Barbara have finally gotten fed up with black bears jumping in their mansion pools and munching on their fruit trees.